Next, in the Ice cream series, you have Almond Ice cream to please your senses. 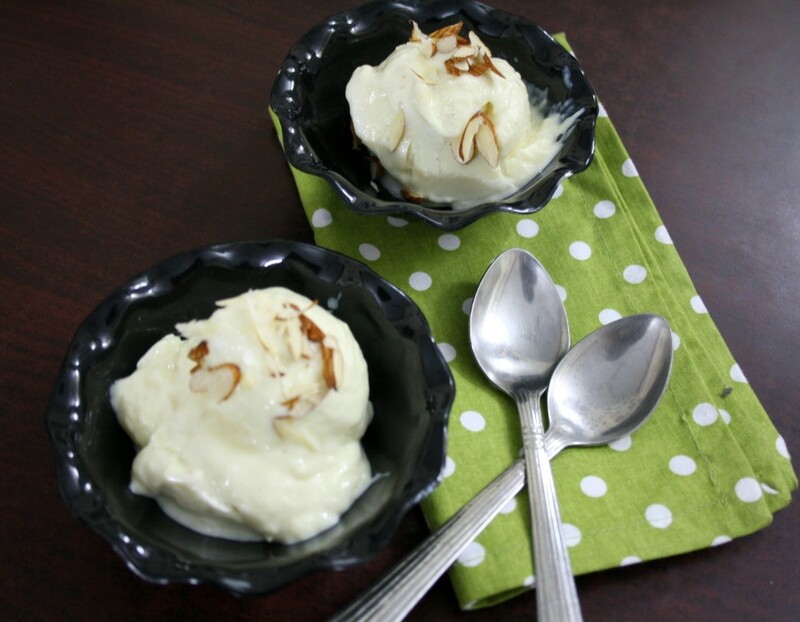 I had this recipe for Roasted Almond Ice cream. Some as I was making it completely got changed into something else. The reaction was that the kids were playing on the system and I couldn’t check out what went in. And I didn’t want to keep asking them to give me a moment. I think that calls for the almonds to be roasted and adding as such. I thought adding Badam powder would be even better. I had the MRT Badam mix, which is a badam drink flavoured with Cardamom. So ended up adding that along with Condensed Milk and cream. You can imagine how creamy the entire mix was. I couldn’t wait to freeze this! When I was about to click pictures, I simply garnished with almond slivers. Once the clicking was over, hubby dear was the first to taste and he wanted to complete the entire bowl. Boys were not interested as it wasn’t chocolate, will have to convince them that it’s Vanilla and add chocolate sauce! We are leaving for a weekend trip to attend a marriage, so this post is scheduled. Boys are so excited about the trip as they are travelling by train since school started. The previous occasion they were very small and didn’t know much. I know we are going to have a handful and quite some experience! You know the mix is ready when it completely coats the back like this. Boil half a litre of milk, once it boils over, lower the flame and remove a cup aside and allow it to cool. To the cup, add corn flour and make a lump less mix. Add this to the simmering milk. Next, add the Badam Mix and condensed milk. Continue stirring, making sure the flame is in low. After 5 mins you will see the liquid getting thick as corn flour solidifies. When the back of the ladle is completely covered when you stir in, you know the mix is done. Switch off and cool. When it is cooled, freeze it to set. This takes about 6 hrs. Once set, while serving garnish with Almond slivers and enjoy! Since you are adding corn flour, condensed milk, there is less chance of ice crystallisation happening. Still, you can whip it after one round of freezing. This looks really good. Tell me what does it taste like… Kulfi or ice cream.. Actually I hardly make ice cream.. Should start making, home made should be so so good. After a long time dear in your blog..Ice cream look yummy! 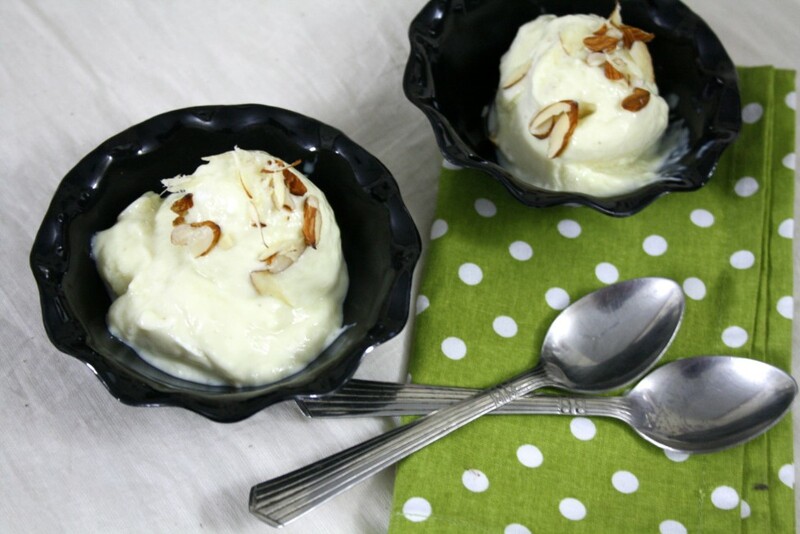 !and so easy to make..
Valli your ice cream has me drooling. Yeh Dil Mange more! Even i have a packet of badam mix, this is definitely a very interesting icecream.Love to have few scoops. I love the idea of luscious ice cream on a dark serving bowl. Delish. 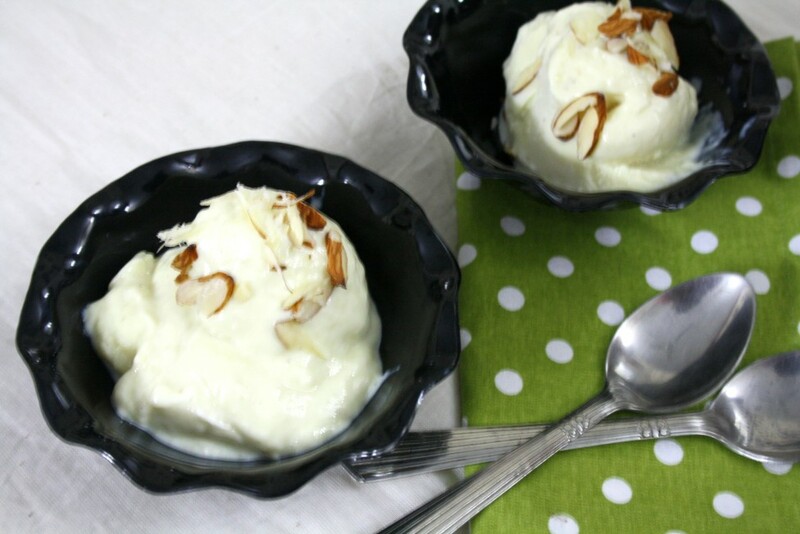 Vaishali, This surely was more like ice cream as I had added quite a bit of cream and condensed milk..
Hw many icecreams u did for this season….. im stunned of ur wrk…..
Sinful and mouth watering!! What else can I say?? I am literally falling in for your ice cream recipes. Its awesome! By the way is it 12 cup of condensed mill or 1/2 cup? This looks great! Almonds in ice cream is kind of a new flavor for me (anything other than vanilla and chocolate is!!). That too made with condensed milk …its making my mouth water!! Absolutely amazing Valli. Why didn't I think of adding MTR badam mix to make ice cream?? Will be trying this flavor too soon.. Thanks for the idea. Interesting one, is the badam mix store bought one.